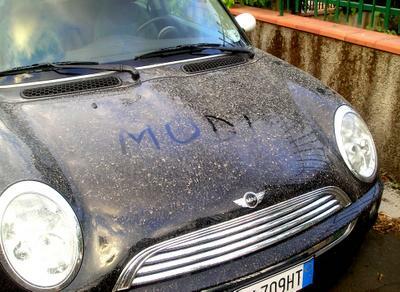 My friend Michael warned me that it sometimes rains mud here on Etna. I wasn't sure I believed it, but on Sunday I became a believer. It's been dry, dry, dry for weeks . . . not a speck of rain. Grass fires are starting on the roadsides. On Sunday, the sky darkened and the wind blew and . . . drip, drip, drip . . . a few sprinkles of rain fell, not even enough to wet the ground. However, it apparently was enough to take the dust and lava out of the air and deposit it on my usually clean and lovely black and white Mini and make a total, awful, horrible, no-good mess on it. I have never seen it look this ugly. During the day, it happened twice more, adding insult to injury. When I got gas, the attendant took one look and washed all my windows without my asking. Even he couldn't stand it. Even though everyone else's car looks just as bad, I freaked out. In Germany, I washed my car several times a week. Here this is impossible. There are no do-it-yourself car washes. Besides, I know if I do wash it, it will happen again immediately.